They were also made of pottery. . The little balls in the ajacaxth of pottery, enclosed as they are, may at a first glance appear a puzzle. 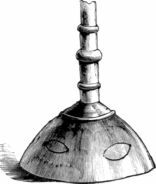 Probably, when the rattle was being formed they were attached to the inside as slightly as possible; and after the clay had been baked they were detached by means of an implement passed through the holes.